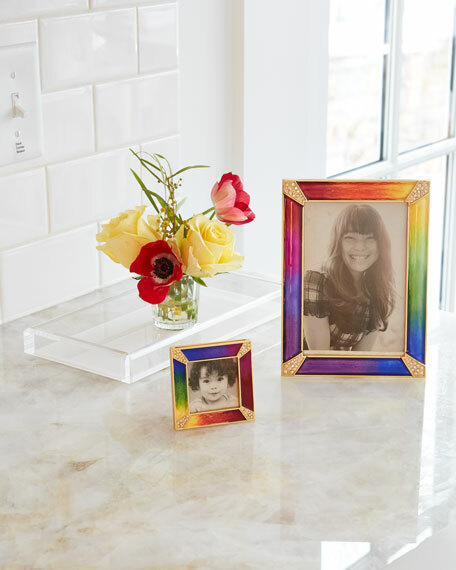 Jay Strongwater Rainbow Pave Corner Frame, 4" x 6"
We have opened our paint box of enamels and painted the zebra pattern Wyatt frame in a pop of rainbow stripes! Cast in pewter, finished in 14K gold and beautifully painted in over 12 vivid enamels by our finest artisans in Rhode Island and sparkling with hand-set Swarovski® prismatic crystals. With our signature, fleur-de-lis metal back plate and kickstand this frame is truly beautiful from any view. Hand-enameled and hand-set with Swarovski® prismatic crystals.